According to local legend, the first animal sacrifices in Bariyapur, Nepal, occurred several centuries ago, when the Hindu goddess Gadhimai appeared to a prisoner in his dreams and asked him to establish a temple dedicated to her. When the prisoner awoke, his shackles had disappeared and he was able to leave the prison and build Gadhimai’s temple, where he sacrificed animals to give thanks to her. Up until now, Bariyapur has continued to host the world’s largest animal sacrifice festival every five years, in which hundreds of thousands of animals, including chickens, goats and buffalo, were marched to their deaths at the site of Gadhimai’s temple. 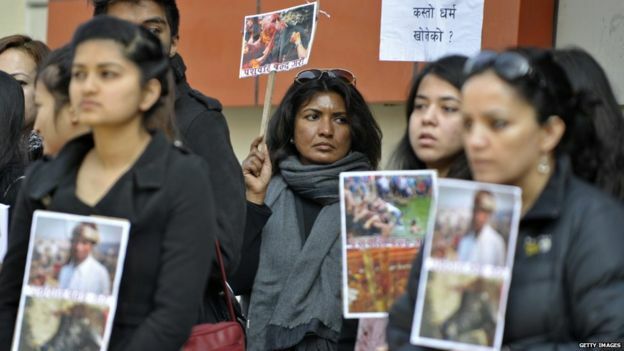 Although there may yet be a long way to go in eliminating the practice of animal sacrifice in Nepal and changing people’s hearts, the temple board’s formal commitment to ensuring that “Gadhimai 2019 is a momentous celebration of life” is a huge step in the right direction!